Sentencing set for Thursday was postponed to April 6 for a woman who stole wallets from brides, bridesmaids and others at four weddings in San Diego. 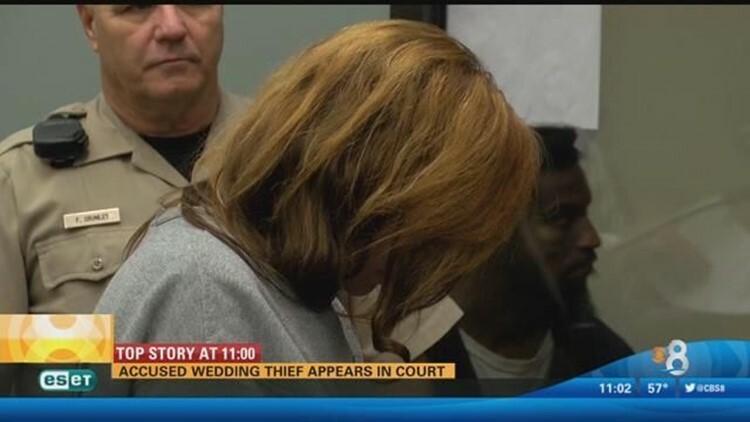 SAN DIEGO (CNS) - Sentencing set for Thursday was postponed to April 6 for a woman who stole wallets from brides, bridesmaids and others at four weddings in San Diego. Sheriff's Department said she was arrested Dec. 6 after she allegedly stole a wallet at a Las Vegas church. Between last July and October, women getting married in San Diego and Riverside counties reported that their wallets had been stolen during their nuptials. Surveillance video captured images of Gunderson at several of the weddings, and also show her later using the victims' credit cards at stores, racking up thousands of dollars in illicit charges, sheriff's Detective Lisa Jenkins said. Prosecutors said Gunderson has been to prison seven times before. She admitted to three prison priors as part of her plea agreement.